(Click to Enlarge - Click Twice to Enlarge the Enlargement) Here Horace Sykes gives a caption with those several signs beside the road. Those on the left are downright forbidding. They read "Caution Road Beyond Dangerous" and "Caution Road Construction Next 10 Miles." The rustic sign far right reads "Entering Mt. Baker National Forest" and that is a hint, which is fulfilled with the metal sign, which tell the driver she or he is leaving Okanogan County and entering Whatcom County. 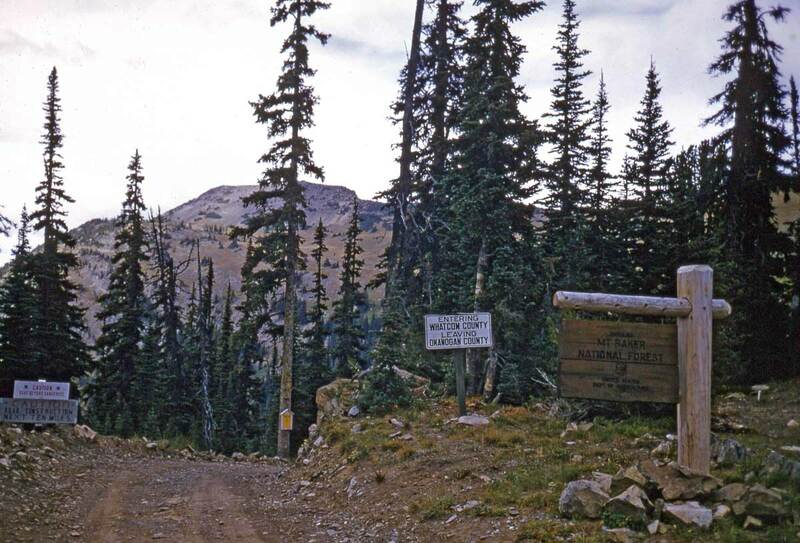 If I have figured this correctly - with the help of Google Earth - this is Harts Pass at about 6190 ft. and that is high for a Washington pass suitable for vehicles with courageous motorists. This is the intersection of National Forest Development Roads 500, 700 and 5400. If you turn around the last of them will take you east into the Upper Methow Valley, the likely route that Sykes climbed to reach the pass. The town of Mazamba is but a dozen crow miles down the way. The view looks north to Slate Peak (if I am reading it correctly). From this county line one can drive by switch backs to the top of the peak (that dangerous road still, I think.) and visit the fire lookout there. At an elevation of 7,488 feet Slate Peak is the highest point one can drive to in this state without going off the road. (A habitat curiosity, that puts it a mere 400 feet below the top of Mt. Olympus in the Olympics and thousands of feet lower than several highway passes in Utah and Colorado. 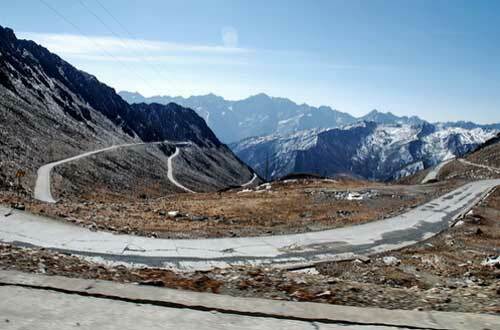 Or we will include - borrowed from GoogleEarth - directly below a snapshot of China's Balang Shawn Pass in Sichuan Province, which is paved at 4523 meters, and that is a few feet higher than the summit of Mt. Rainier. Apparently this paving - and the highway pass generally - was very beat up by the May 2008 earthquake in Sichuan.) North of Harts Pass towards the Canadian border are more passes with names, in order, like Windy, Foggy and Woody. Those are for hiking. For habitat and elevation comparisons with Harts Pass here is a look north from China's Balang Shan Pass in Sichuan Province. Elevation at the pass is higher than the summit of Mt. Rainier - by a few feet. And it is paved!